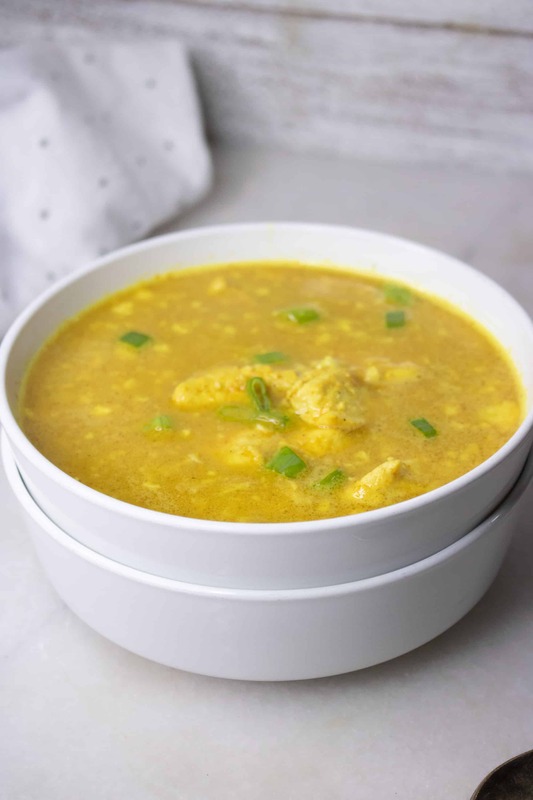 This amazingly delicious Curry Chicken and Cauliflower Rice Soup recipe has arrived on the scene at the perfect time. Most of the country is experiencing a frigid record-breaking cold spell. It is the kind of cold that chills you to the bone and makes you wonder if you will ever be warm again! 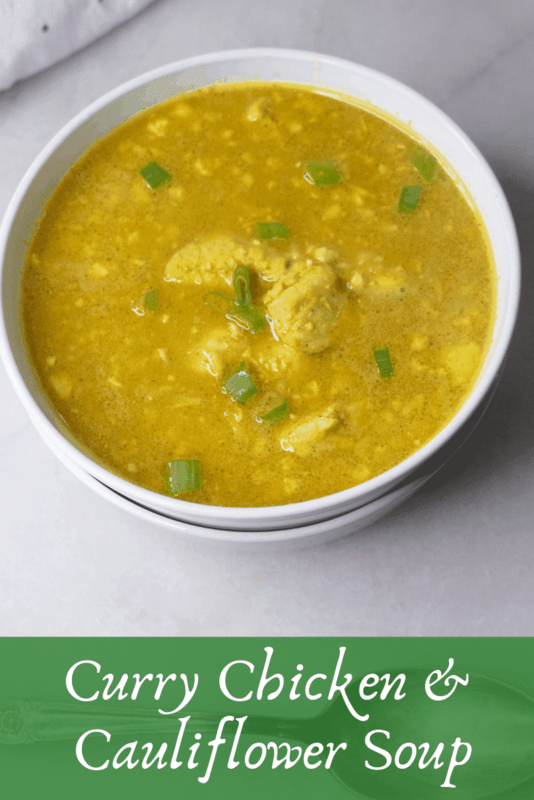 In my opinion, nothing warms the body and soul like a steaming hot cup of delicious, warming homemade soup and this Curry Chicken and Cauliflower Rice Soup is a perfect choice to do just that! Using packaged riced cauliflower is a tasty healthy, low-carb and grain-free (and easy) addition. 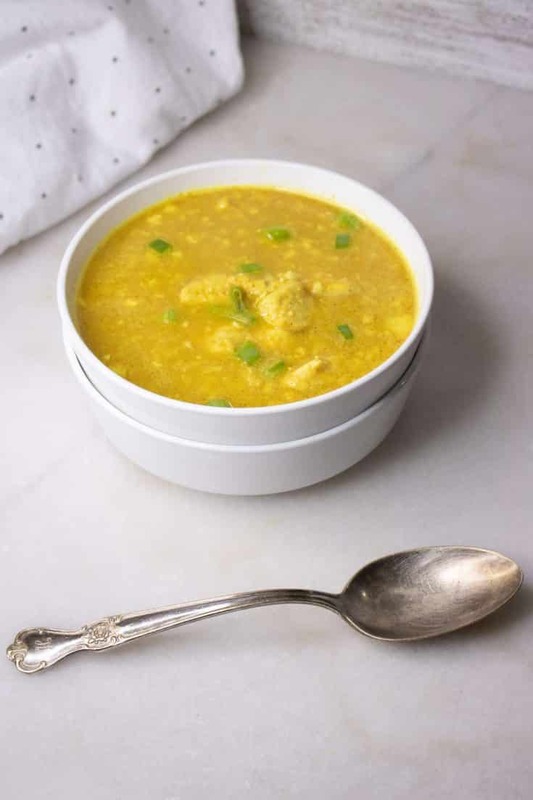 The curry powder gives a tiny bit of heat and turns this soup is a gorgeous shade of golden yellow. You know…like the sun you haven’t seen in a while. Just looking into the bowl is bound to perk you up a bit and take off a bit of the chill. Curry has become extremely popular. Most people probably believe that it is a spice, which is true…kind of. It is actually the combination of anywhere from 5 to 10 different spices such as turmeric (which gives it the gorgeous yellow/gold hue), cumin, coriander, ginger, and pepper to name a few. So, each curry blend is ever-so-slightly different. Curry powders also differ in their amount of “heat”, so to speak. Some are mild, while others are a bit warmer and still others can pack a punch. 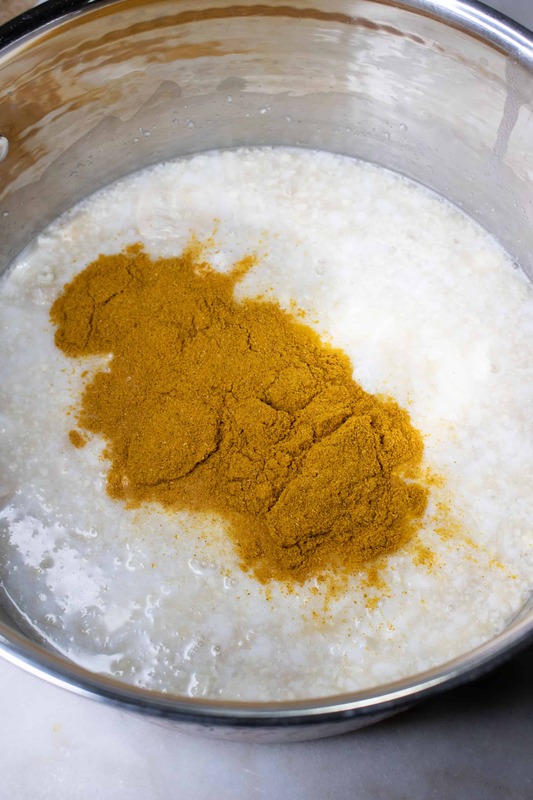 While you might think of curry being an Indian spice, the truth about curry powder is that is was created by the British colonists in an attempt to copy and recreate the delicious flavors of the South Indian dishes they had grown to love. Who knew? 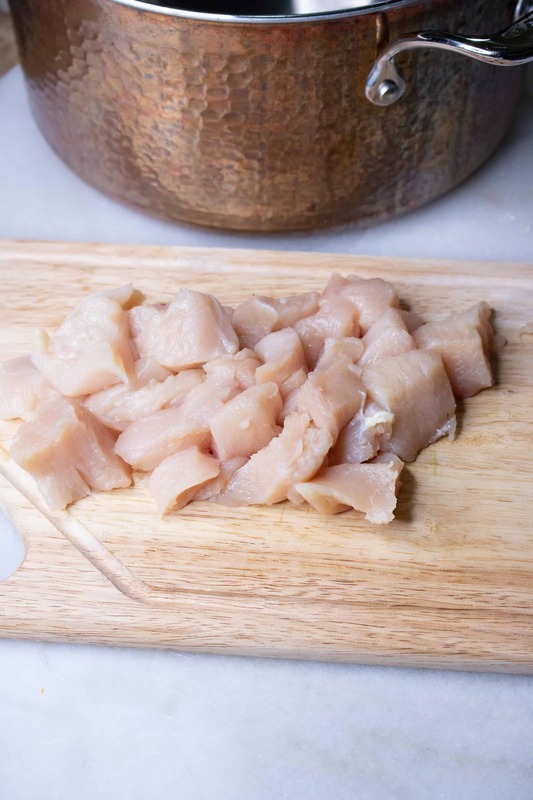 Step #1: Cut chicken breast into cubes. 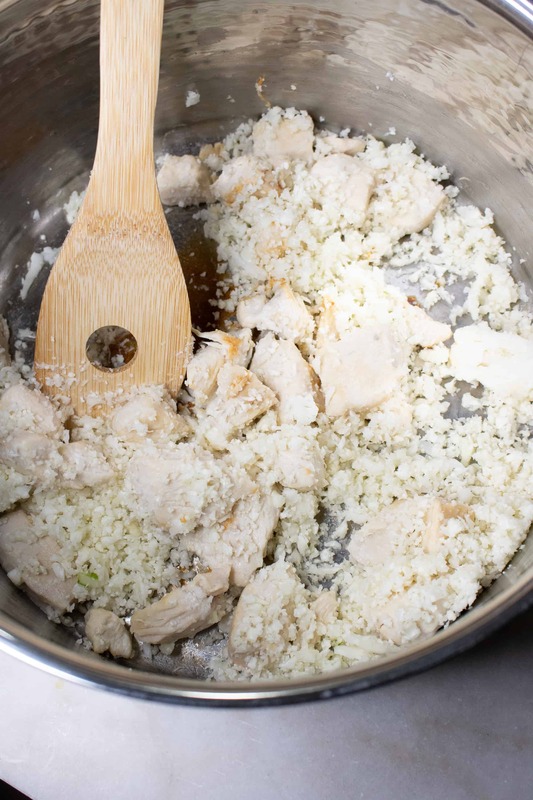 Step #2: Cook chicken and cauliflower rice in pot. 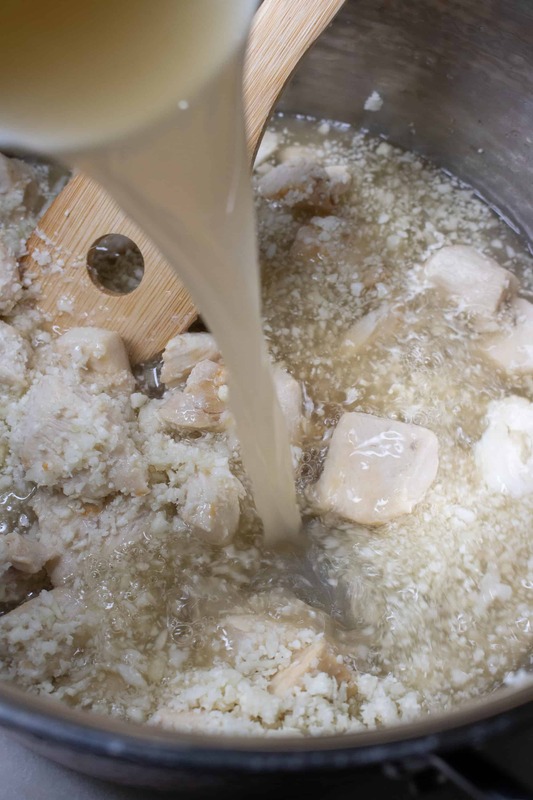 Step #3: Add coconut milk to chicken and riced cauliflower mixture. Step #4: Add curry powder to pot. Step #5: Heat over medium-low heat until soup comes to a low boil. Step #6: Reduce heat and simmer for 30 minutes. Then just serve and enjoy! Try these delicious (and cute) Heart Shaped Breadsticks to dip in your Curry Chicken and Cauliflower Rice Soup. Or surprise everyone with these popular, yummy Macaroni Grill Copycat Rosemary Breadsticks. I love having a crisp, green salad when I eat soup. This Italian Salad Recipe with Homemade Italian Dressing would be perfect. Cut chicken breast into cubes. 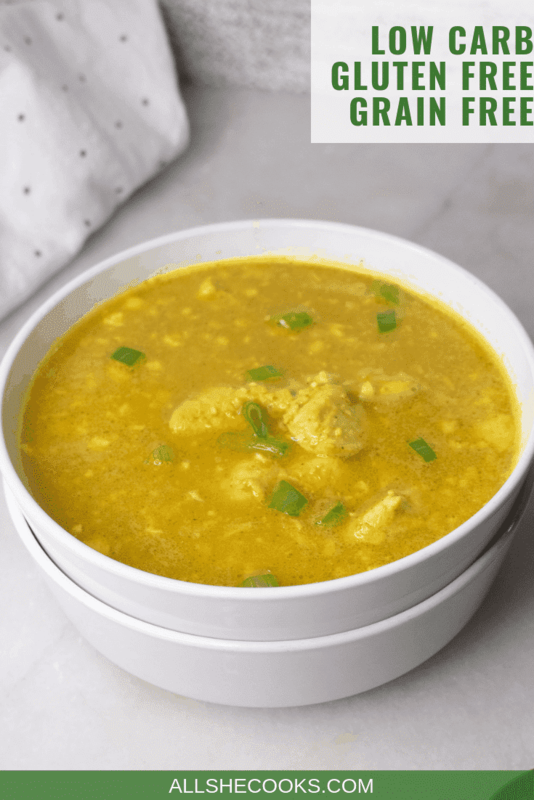 Cook chicken in a stock pot with the coconut oil until done. Add remaining ingredients and heat over medium-low heat until soup comes to a low boil.